Liguria holidays take you to Italy’s northern coastline and offer luscious green scenery and colourful Mediterranean architecture. It’s also known as the Italian Riviera and is located between the Mediterranean Sea and the Alps, with the luxury and opulence of neighbouring Monaco seeping across the border to this spectacular region. Couples will love exploring the historic architecture of the town, while families will find lots of activities available on the beach. And when it comes to exploring there are UNESCO listed world heritage sights and more to be discovered. 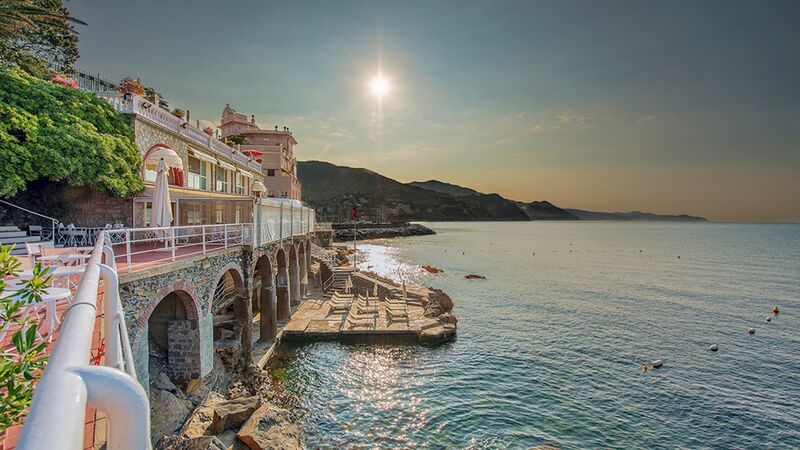 When it comes to choosing towns you’ll be spoilt for choice in Liguria. Head to Portofino for seaside glamour and a picturesque port which attracts the rich and famous year after year. This former fishing village has some upmarket restaurants and boutiques which make it ideal for exploring, as well as historic sights which rub shoulders with the pastel coloured houses along the coast. Alternatively, Rapallo has a sun drenched harbour full of yachts and fishing boats, as well as a 16th Century castle for history lovers. Holidays in Liguria bring you peaceful landscapes, chic and colourful towns, and upmarket harbours. Spend your days on the beaches before heading to a cool bar for drinks and refreshments, or star spotting along the ports. When it comes to hotels there are some fantastic choices, while upmarket restaurants offer a mixture of fine dining establishments and family run tavernas with spectacular traditional Mediterranean flavours on offer. If you prefer to indulge in some retail therapy, there are boutiques and designer shops to be found throughout the region. Book your luxury holiday in Liguria with Sovereign and we’ll help you make the most of your time away. We understand that a holiday isn’t just a two week break in the sun, it’s about connecting and making lifetime memories. We’ve put together our list of the best hotels in the area, allowing you to find your ideal choice. 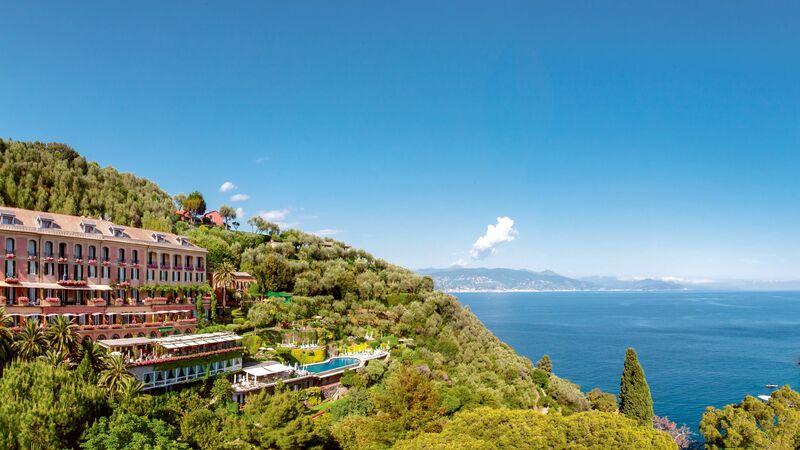 Stay at the Belmond Hotel Splendido for luscious surroundings and beautiful Mediterranean architecture perfect for a relaxing break. Alternatively, the Excelsior Palace offers views of Rapallo’s harbour from its infinity pool and beautiful terraces where you can soak up the sun. I’d recommend an afternoon in Portovenere – the gorgeous village just to the south of Riomaggiore. Although not one of the five Cinque Terre villages, it’s included within their World Heritage Site. It’s a great spot for lunch. This area is known for its pesto, so make sure you try a pesto-based dish – delicious. Portofino is synonymous with luxury, balancing elegant hotels, a designer shopping scene and colourful townhouses around a hill-hugged harbour on the Ligurian coastline. Rapallo is a coastal town with spades of old-world charm. It’s also a great base for exploring the Italian Riviera, thanks to the harbour and mountain cable car. Just along the coast from Portofino is the Cinque Terre National Park. With its craggy cliffs and colourful villages, it’s one of the most photogenic places in Italy. Charge up your camera and spend a day exploring its tutti-frutti towns. Travel between them by boat or train, or follow the hiking trails carved into the cliff-sides (reward yourself at the end with a chilled glass of the local white wine). Liguria’s capital city is around an hour’s drive from Portofino. It boasts a huge, UNESCO-listed old quarter, a collection a fantastic museums and palaces, plus plenty of quirky boutiques and artisan workshops. Time your trip to include lunch – make it a plate of pesto pasta, made with Genoa’s DOC basil (perhaps followed with a slice of traditional Genoese sponge cake).